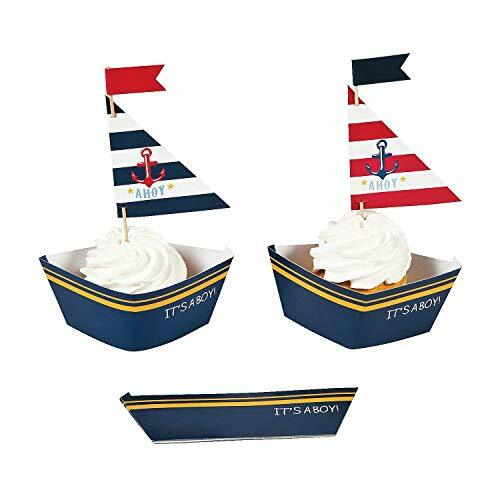 Easily decorate a professional-looking nautical-themed cake. 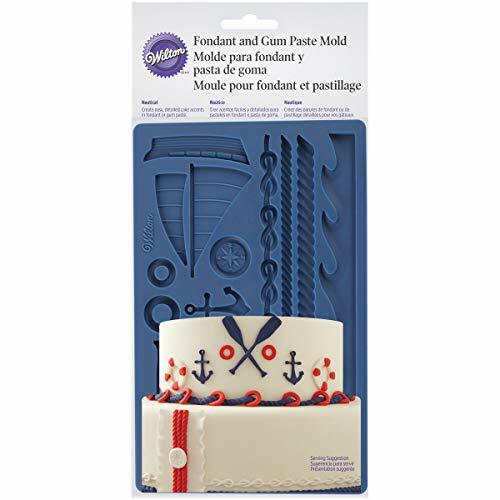 The nautical fondant mold features a sailboat, compass, steering wheel, anchor, ore, life raft, 2 inner tubes, a knotted rope border, 2 additional size rope borders and a wave border. Simply press fondant into mold to create precise patterns. 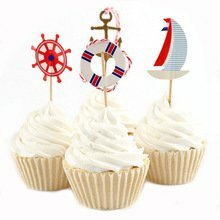 Decorate party treats using these edible cupcake toppers. 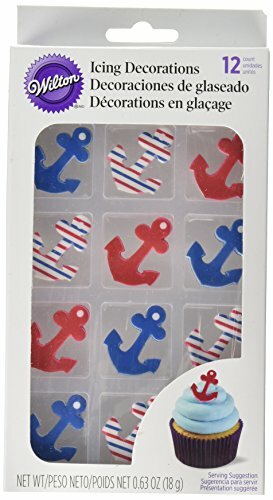 Festive Nautical Theme Anchor Edible Cupcake Toppers offer the perfect finishing touch to cupcakes, cookies and more. You are purchasing an assortment of 12 sugar decorations. You will get a mixture of all three decorations but they may not be even amounts. Each measures 1 1/4 - 2 inches. These are colorful sugar shapes, a sugar cube shaped into a design and decorated with food coloring. So simple and easy to use to create absolutely instant decorations on cakes, cupcakes, cookies, ice cream, brownies and other desserts. The shelf like is the same as the sugar cubes you purchase in the grocery store for coffee and tea, almost forever if kept sealed in their container and stored in a cool pantry or cabinet. Simply lay on your dessert using a dab of frosting. These are kosher certified. 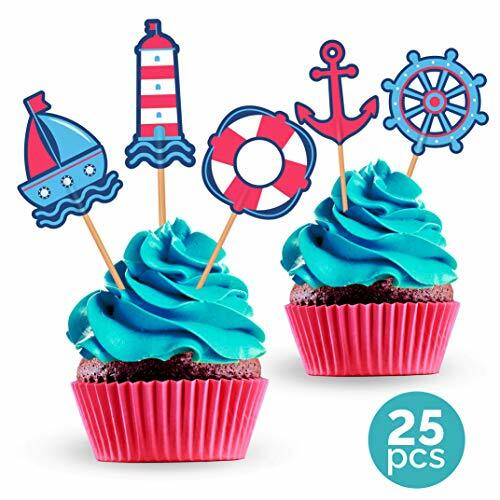 Colorful blue and red cupcake toppers to decorate your under the sea party, nautical wedding celebration, sailor birthday party, ahoy baby shower for girl or boy, bridal shower or any other special event. 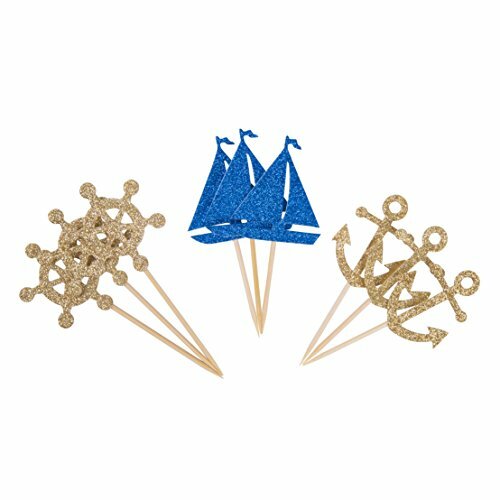 Pair these cupcake picks with our coordinating nautical party banner. 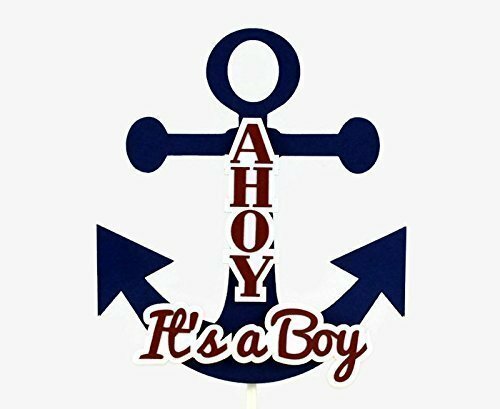 This anchor cake topper is a perfect addition to the cake at your nautical theme baby shower. It is laser cut from heavy duty card stock and is attached to a white lollipop stick. 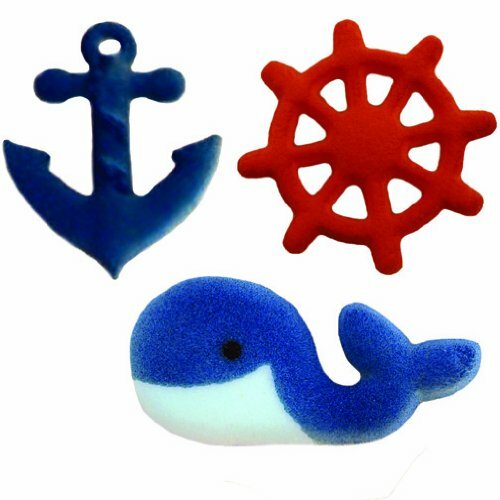 The navy blue anchor measures 5.25" wide by 6" tall. The words are attached to the front with foam tape to give it a slight 3-D look.